On 15 March, Reeperbahn Festival hosted a business event at “Reeperbahn Hamburgers”, followed by a showcase featuring six bands and artists at Friends Bar on Austin’s 6th Street. After playing several guerrilla street gigs, Meute performed at the Reeperbahn Festival showcase – wherever the band went, a couple of notes was all it took before everyone was up and dancing. At the showcase, Meute’s gig was followed by performances of the psychedelic rock band Blackberries, Fishbach, and celebrated electro-pop acts Vita and the Woolf and CIFIKA. Unfortunately, Ace Tee had to cancel her showcase appearance. The Reeperbahn Festival team was also available on several days for burgers and beer at Reeperbahn Hamburgers, presented by the City of Hamburg, or at Barracuda and had the chance to meet old and new contacts and successfully represented the upcoming Reeperbahn Festival New York Edition in June and the ANCHOR - Reeperbahn Festival International Music Award in September. With so many positive impressions from Texas, the Reeperbahn Festival team will now turn its attention to New York City, where part two of the Reeperbahn Festival’s activities in the North American music market – the Reeperbahn Festival New York Edition – will take place from 18 – 23 June 2018. We’re pleased to announce a continuation of the partnership with Audio Branding Academy. For the third time in a row, the Audio Branding Academy will be returning to Reeperbahn Festival to honour the best and most innovative audio concepts and sound solutions, and to celebrate the awards ceremony for the ISA – International Sound Awards for the second time, to be held at Gruenspan on the evening of 20 September. Again, the motto of the ISA – International Sound Awards is “Make the world sound better!”. The Audio Branding Academy awards and promotes the best and most innovative cases from the fields of sound and music technology. The intention of the awards is to give all players from these fields a platform – from audio service providers to audio hardware/software developers to sound artists and beyond. Submissions will be accepted until 31 May 2018. A series of case presentations on 19 September and a trade fair during the day on 20 September complete the programme of the International Sound Awards at Reeperbahn Festival 2018. This year's South By Southwest (SXSW) in Austin, Texas was a great success in many ways. 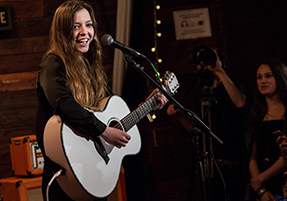 Not only did we have the chance to meet old and new contacts and promote the upcoming ANCHOR - Reeperbahn Festival International Music Award in September, but also we were especially delighted to see ANCHOR 2017 winner Jade Bird play several shows during SXSW in Austin. Luckily the artist took time to speak to DIY Mag about all what happened since she scooped the ANCHOR 2017. Read Jade Birds full story at the ANCHOR website. Reeperbahn Festival Conference offers a wide range of options for marketing your product or brand to an international audience of music and digital industry professionals. Now is the time to secure your presentation at Reeperbahn Festival. First come, first served! Contact us. We’ve put together a great selection of hotels located on and around the Reeperbahn – all available at a discounted rate. You can choose from a wide variety, the selection also includes the famous ARCOTEL Onyx Hamburg, which is once again the official festival hotel. The discounted hotel offers are available for registered delegates of Reeperbahn Festival only. Ready to book? This way, please.